Prior to visiting the Middle East, we had visions of hot, dry desert landscapes with giant sand dunes and rocky sandstone mountains. Although the emirate of Dubai is technically located in the desert, the global mega-city certainly does not fit this image. 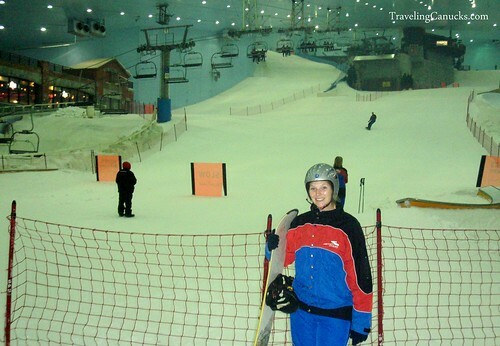 One of the top attractions in Dubai is “Ski Dubai”, an indoor ski hill connected to the Mall of the Emirates. The idea of snowboarding or skiing in the Middle East contradicts logical thinking, which instantly had us intrigued. Dubai’s heat and humidity is unforgiving. Without question, it’s the hottest city we have ever visited (it didn’t help that we visited during the summer). Heck, even the public bus stops are air-conditioned! Our minds struggled with the notion that we could actually experience snow in such a hot and humid environment. Although we were on tight backpacker budget, we had to give it a try because it’s one of the more interesting Dubai attractions available for a reasonable price (about $50 CDN). After all, it’s not every day that one can say they went snowboarding in the desert! 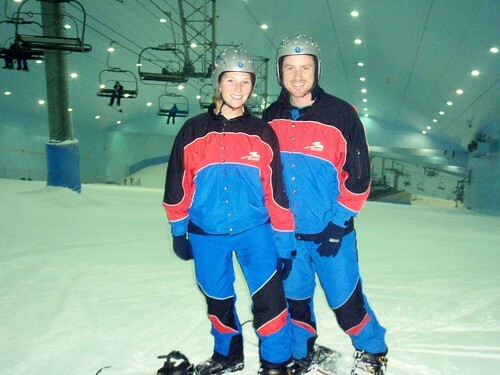 We visited Dubai on our backpacking trip around the world, meaning we were ill-prepared for snowboarding. 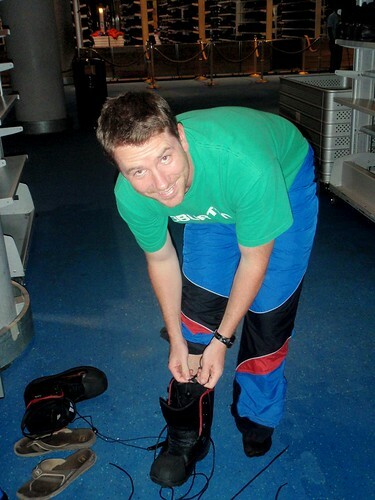 We entered Ski Dubai in shorts and flip flops, crossing our fingers that we could rent outwear and equipment. Fortunately, in typical Dubai fashion, within minutes we were completely sorted from head to toe. It actually wasn’t too bad! We went in with limited expectations, for obvious reasons. After all, we’re used to snowboarding in Whistler, Canada’s top ski mountain. It’s not a big ski hill and certainly doesn’t have steep powder runs, but the snow is surprising soft and fast. It’s a decent representation of typical outdoor conditions and it does a good job of satisfying that snowboarding and/or skiing itch. 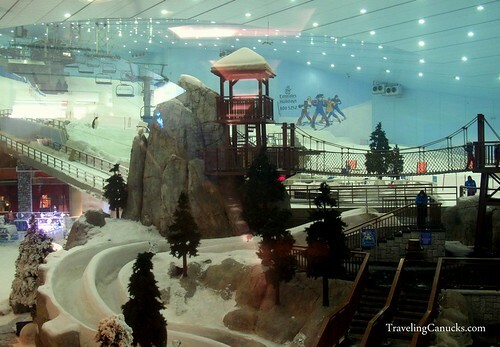 View of the indoor ski hill and sledding park from inside the Mall of the Emirates. Dubai shopping malls are quite extravagant to say the least! Gearing up to go snowboarding in Dubai. Notice the flip flops – it’s not everyday you switch from flip flops to snowboard boots! 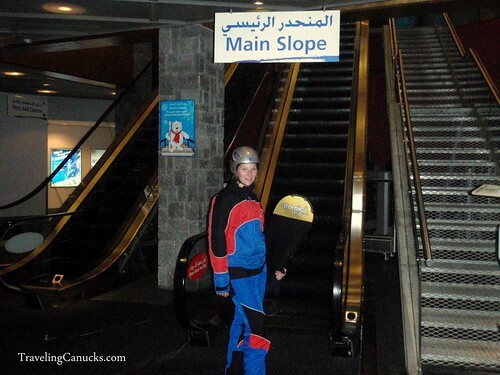 Have you ever taken an escalator to the Main Slope of a ski hill? Sweet rockin’ retro outerwear too! Nicole at the base of the ski hill. We were in Dubai during a Muslim holiday, which is why the park was so empty. Top of the ski hill. You can get an idea of the snow quality by looking beside our feet. 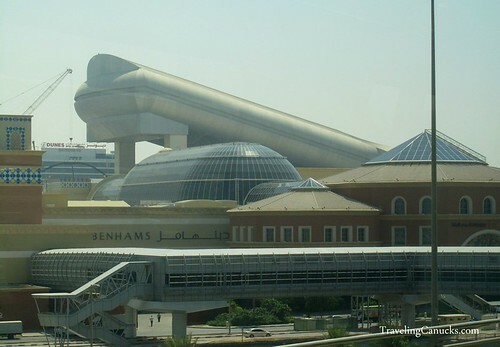 Outdoor views of the Ski Dubai Indoor Ski Hill and The Mall of the Emirates. 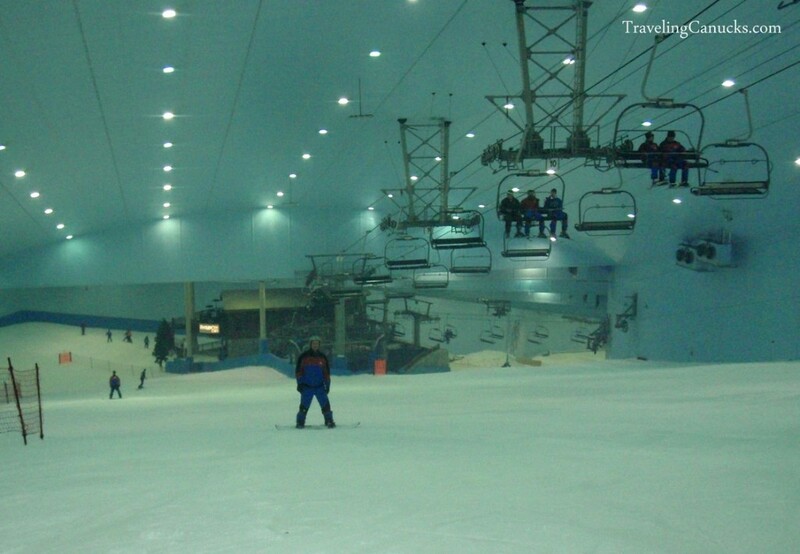 Have you ever experienced an indoor ski hill? What did you think? Share you story in the comments section below! Saw this on the Amazing Race. Just seems kinda wrong doesn’t it?! It’s very strange to think of skiing in the Middle Eastern desert. I don’t even want to know how much energy is consumed to power such an operation! But that’s the tale of Dubai, isn’t it? Totally unique travel experience though, only time I’ve ever taken an escalator to the ski lift!! Haha… yes, a trillion dollars of oil money and foreign investment goes a long way! Pretty wild considering what the outside temperatures would be. I just wonder how much oil goes into running the place on a yearly basis. Great fun but at what cost? Guess you don’t need sunscreen inside. I image a LOT of energy is wasted trying to power it. Amazing, but of course Dubai has this. I remember seeing an ice rink in a mall in Quito and thinking how cool it was to see everyone trying to skate. But seeing this would have blown my mind. Good to hear that the snow was decent and it scratched that itch to board. Too funny that the lift is an escalator, and yeah, I can’t imagine how much it cost to run it. So did many locals partake or was it mainly foreigners? We were there during the Muslim holiday of Ramadan, so there were no locals there at the time (we were there during mid-day). The majority of Dubai’s population is made up of expats, so it’s hard to say. Apparantly it can get quite busy, we were lucky that we had the place virtually to ourselves. It’s weird seeing you in a full snow suit in a shopping mall! Very cool! I always wondered… do they have one lift and one slope? Or multiple? How long does it take you to ski/smowboard from top to bottom? There is only one chair lift but two runs (one on each side of the chair lift). It’s a small hill so you can get to the bottom pretty quickly. It really depends on your skill level. If I remember correctly, it was less than a minute from top to bottom for us. So it’s more for the fun of skiing in the desert than the actual skiing 🙂 Still looks like fun though! I love this! I can’t ski or snowboard but this is awesome. That’s amazing! Have you any idea if the place is as busy now that the recession has hit so hard in the region?? Oh man, and no long queues! It’s so weird to have this in the middle of the desert. Although on the bright side you can go to the beach after a snowboarding session. Exactly! That’s what we did. The Mall of Emirates is fairly close the the Palms, so we went to the luxurious Atlantis Hotel afterwards. Great beaches, the water is so warm its like being in a hot tub. I have to say that this intrigues me. It’s kind of surreal, but I’d love to have the experience. I saw a clip about it when it first opened, but it’s really cool to see your photos. Our original goal was to go sandboarding AND snowboarding in the same day, which is totally doable in Dubai (sand dunes aren’t too far out of the city). Only problem was that we were there during Ramadan, and Ski Dubai didn’t open until later in the afternoon. We could only go sandboarding in the evening b/c it gets too hot. Not worrying about the weather is another huge plus for indoor skiing! Being Canadian as well, where I have 4 ski skills within an 11/2 drive this is so bizarre. I’d hate to think of all the energy consumed as well, but glad people have a chance to experience skiing/snowboarding. Agreed. Thinking about all the wasted energy is a hard pill to swallow but it’s so cool that you can actually play in the snow in the desert! Very cool. I’ve seen this on numerous tv shows and it always looks so odd. I can’t imagine going from blistering hot to snowboarding. I would definitely love to try it though. Yes – it was kind of strange to be in flip flops one minute, the next on a chair lift to go and play in the snow! Oh man, you guys are the coolest. I want to try this! I love snowboarding! Definitely nothing like Canadian mountains, that’s for sure! The nice thing is that you don’t have to worry about poor weather conditions. I’m not sure its something that we would do often, but we did see some people with passes, so I’m assuming that it gets a lot of repeat visits. And I thought indoor ice skating in Missouri was the bomb! I guess I need to get out more…or just live vicariously through you two! Great post – looks like tons of fun! Haha gotta love Dubai for all its crazy inventions! Very cool! I saw this on the Amazing Race. That must feel pretty strange to take an escalator up to the “mountain”. Awesome photos and account! Sounds like fun … but it looks sooooo environmentally unsustainable. Definitely not the most environmentally friendly option! This is such an exciting place. A fun place to be visited again and again. That is incredible. I bet its an odd feeling walking through the doors! There is a big swimming pool in Germany, converted from an old plane hanger. I guess with a lot of money you can make a lot happen! Wow, where in Germany? Never heard of it. I lived in Dubai several years back and this was one of my favorite places, a true hideout away from the sun! I’m originally from Canada teaching in Dubai, I guess you can call this my home away from home. Yes, it’s amazing what people can do with money.